Bluestacks app player is one of the best application software which is developed by the huge investment made by Intel, Samsung, Qualcomm, and AMD. These companies brought a new idea of launching an android emulator which can be run on Microsoft Windows of PC and Laptops in 2009 of 25th April. This app player is made with excellent features of loading as well as downloading apps. This software is free of cost with so many updated versions which will help in supporting your Microsoft window compatibility. It also avails their users so many options which enable faster game play, premium support along with exclusive exciting offers. It is that smartphone which can be accessed on your PC or Laptop. This app player is having all those special features which a smartphone is having. The only requirement for downloading this app is ‘ your PC should have 2 GB or higher memory along with 4 GB space should be there in hard drive and Direct X 9.0 or higher installed so that your computer device should get compatibility for this brilliant app player’. The Proper app store is available in this software which can be assessed by PC as well as Mac OS. Millions of people across the world are enjoying its elegant full-screen technology by downloading the high rated apps such as Whatsapp, Facebook, Instagram, etc and high rated games can be accessed by this software. High rated games include ‘clash of clans, assault racing game, etc’. the ‘layercake’ technology enables the more intensity by providing high graphics within this app player which will help you to play and load heavy games on your PC. Bluestacks app player is the first app player which secures their users by providing them high rated security along with privacy which can’t get misused by any hacker. Though there are so many versions available on internet related to this app player you should prefer recently published latest version i.e. Bluestacks 3.0. This version launched into the market in 2017. 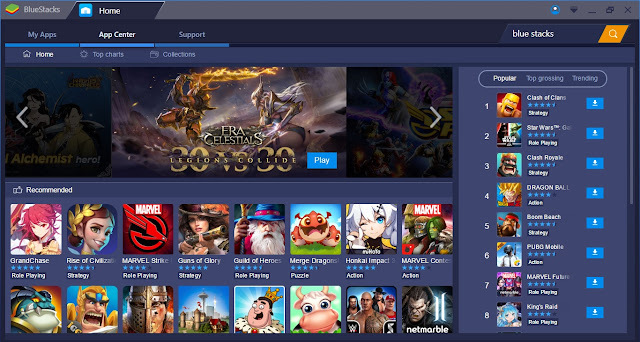 Bluestacks app player is cloud base cross-platform product. It is designed for all those users who want to access android applications on their PC or macOS. It is developed with high-quality graphics which allows this software to run heavy games along with heavy applications. Numerous versions of this app player are available on the internet which can be compatible according to the specification of your PC or macOS. Hence, these are the versions available on the internet of bluestacks app player. So, we can see that this app player is compatible with almost all the Microsoft window devices. Your PC should have 2 GB RAM which is considered as a main memory of the computer. You should be an administrator of your PC which will allow you privacy option. How to download and install this android emulator on your PC or Apple Mac/MacOS? First of all, you have to visit the official website of Bluestacks i.e. www.Bluestacks.com. When you enter into the website then you will find an option of Download on the bottom of the page. So click on the download button or click on this Bluestacks direct download offline installer link. After that, it will redirect you to the “Save to start downloading” option. So when you click on save button then the whole setup of Bluestacks app player will be downloaded to your PC or Apple Mac. Then run the setup to install it on your computer. Hence these are few steps of downloading and installing this fantastic software. Try it!! Is it safe to install on windows 10 or Apple Mac? Bluestacks is an emulator which Is used to execute android apps and games on your windows or Mac devices. So, one thing is clear about this software that it is not cover under the category of any virus or malware. Use this software freely without any doubt because it also allows you to sync your data with your android devices and also notify you all the updates on your device. according to the WOT, Bluestacks has been rated 4.6 stars based on public reviews. Trustworthiness is 92% and child safety is 91%. according to the trust pilot, it has some complaints but based on only 23 reviews. if you have a good pc or mac you are good to go with it but make sure that you are downloading Bluestacks from official website.